"This is a traditional dish during Ramadan months especially. Translated this from Turkish so I apologize if the measurements are slightly off." Heat oil in a large skillet over medium heat. Cook and stir onion in hot oil until golden, 2 to 3 minutes. Stir tomatoes through the onion; continue cooking until tomatoes soften, 1 to 2 minutes. Pour beef broth over the onion and tomato mixture; bring to a boil. Stir bulgur into the boiling broth; season with salt and black pepper. Reduce heat to medium-low and cook at a simmer until the bulgur begins to soften, about 5 minutes. Add lentils and chickpeas; continue cooking until the moisture evaporates and the bulgur is tender, 3 to 5 minutes more. Remove the skillet from heat. Set aside to cool about 30 minutes. Fold mint into the bulgur mixture to serve. 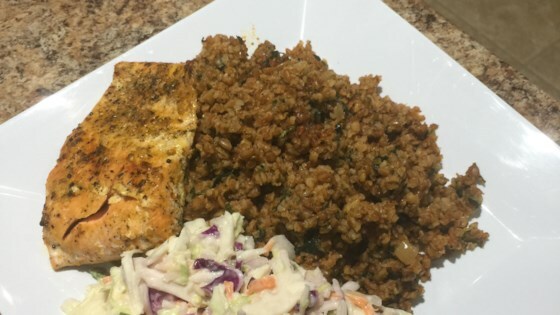 Nice recipe, I added in some ground beef and switched a cup of rice for the two cups of bulgur.